A healthy diet is essential for managing diabetes and losing weight. And there are certain foods that you need to choose carefully, particularly carbohydrates. But, this can be a confusing task. We are told to avoid simple carbs and refined ones, and choose complex ones, but what does that all mean? Foods that contain carbohydrates include starches such as grains and starchy vegetables, fruit, milk/yogurt, snack foods, and sweets. Carbohydrates are the macronutrient that affect blood sugars the most. They are important because carbohydrates play a role in providing the body with energy. They also add flavor, fiber, and texture to foods. What Do Carbohydrates Do and Why Do You Need Them? When eaten, carbohydrates are metabolized and broken down into sugar or glucose. Glucose is the body's primary source of fuel or energy, but when you have prediabetes or diabetes your body does not handle sugar properly. Instead of sugar being taken to the cells to use as fuel, it remains in the blood. Excess or high sugar in the blood can be very problematic. To avoid elevated sugars, you should aim to eat a variety of good quality carbohydrates. In fact, the type of carbohydrates you choose can affect your mood, blood sugar, and energy levels. Eating a healthy, balanced, high fiber, carbohydrate controlled diet can help to reduce blood sugars, lose weight and increase energy levels. Excess carbohydrate intake can cause weight gain because glucose that is not used as energy or stored for later use in the muscle or liver is stored as fat in adipose tissue. What Types of Carbohydrates Should you Eat and Avoid? When choosing carbohydrates, it's best to choose complex carbohydrates that are rich in fiber and low in sugar. Simply stated, complex carbohydrates are defined as polysaccharides, which means that they contain at least three glucose molecules. Foods that fall into this category are starches, such as legumes, grains, peas and potatoes. Dietary fiber is also considered to be a starch and is found in non-starchy vegetables and whole grains. Simple carbohydrates are those foods that contain only one or two sugar molecules, they are referred to as monosaccharides and disaccharides. These foods include things like milk, fruit, juice, table sugar, and syrup. Some simple carbohydrates are healthy, such as fruit, and low-fat/non-fat milk. These foods contain protein, calcium, vitamins, minerals, antioxidants and fiber, which can boost nutrition and slow down how quickly blood sugars rise. Although they are healthy, they should be portion controlled. Other simple carbohydrates such as syrup, juice, soda, table sugar, etc contain little fiber and no real nutritional value - which can cause blood sugar spikes, cravings, and weight gain. These types of foods should be avoided altogether or eaten very sparingly. Refined carbohydrates, such as white bread and white pasta, are starches undergone processing which removes the bran and germ of the grain, stripping them of fiber, vitamins, minerals and antioxidants. These foods can also cause big blood sugar spikes and yield little to no nutritional value. Instead of choosing refined grains, it is better to choose whole grains. 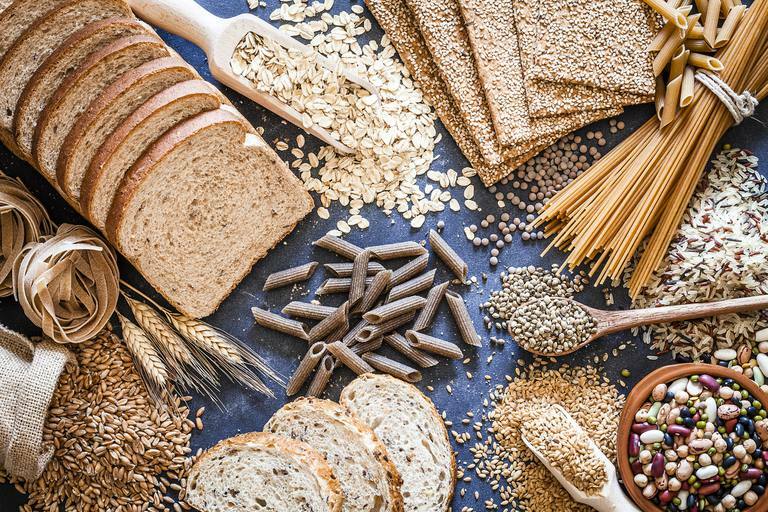 In fact, research has shown that choosing whole grains instead of refined grains can reduce the risk of heart disease, decrease blood pressure and aid in weight loss. The fiber found in whole grains slows down the speed at which blood sugars rise. Whole grains also contain more vitamins, minerals, and antioxidants. Ask your registered dietitian or certified diabetes educator how many carbohydrates you should be eating per meal for weight and blood sugar control. Leehman, Sheran. What are Simple Carbohydrates? Scott, Jennifer. What are Refined Carbohydrates. Do You Know the Difference Between Simple and Complex Carbs? How Do Carbohydrates Affect Blood Sugar?